Mark Bevan, PhD, professor of Physiology, was the senior author of the study that identified a link between Huntington’s disease and dysfunction of the subthalamic nucleus. Northwestern Medicine scientists have identified a link between Huntington’s disease and dysfunction of the subthalamic nucleus, a component of the basal ganglia, a group of brain structures critical for movement and impulse control, in a study published in the journal eLife. Huntington’s disease is characterized by the progressive loss of nerve cells in the brain and affects approximately 1 in 10,000 people. This fatal disorder is caused by a hereditary defect in a single gene. 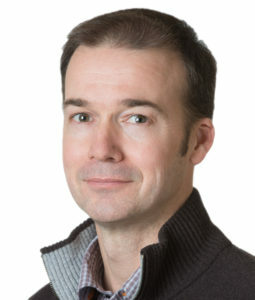 “Although the genetic basis of the disease is well established, why the mutation leads to the expression of symptoms and loss of brain tissue remains poorly understood,” explained senior author Mark Bevan, PhD, professor of Physiology at Northwestern University Feinberg School of Medicine. The debilitating symptoms of Huntington’s disease typically manifest in adulthood and involve loss of motor and cognitive function, depression and personality changes. From the point of onset, symptoms develop and intensify over the following 10 to 25 years until death, typically due to complications associated with the disease. 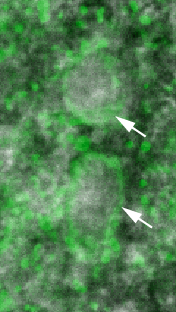 Energy producing mitochondria (labelled in green) of subthalamic nucleus neurons (marked with arrows) are subject to increased oxidative stress in Huntington’s disease mice. Using mice genetically engineered to carry the Huntington’s disease gene, scientists discovered the electrical activity of the subthalamic nucleus was lost. Furthermore, impaired subthalamic activity was caused by anomalous receptor signaling, leading to defective energy metabolism and accumulation of damaging oxidants. The authors also found abnormalities in the subthalamic nucleus occur earlier than in other brain regions, and that subthalamic nucleus nerve cells progressively degenerate as the mice age, mirroring the human pathology of Huntington’s disease. “Our findings suggest early problems in the subthalamic nucleus not only contribute to the symptoms of Huntington’s disease, but are also likely to impair the processing capacity and health of other brain structures, more traditionally associated with the disease,” Bevan said. Currently, there is no cure for Huntington’s disease; treatment can only alleviate some of the symptoms. A better understanding of aberrant brain receptor signaling that leads to nerve cell dysfunction could reveal a target for therapy, according to the authors. Additional Northwestern study authors include: lead author Jeremy Atherton, PhD, research assistant professor of Physiology; D. James Surmeier, PhD, chair of Physiology; David Wokosin, PhD, research associate professor of Physiology; Eileen McIver; and Matthew Mullen.